We achieved the certification through Australian Organic by putting in place new screening processes to remove plastics and other inorganic materials from the kerbside waste as well as stringent product testing and cleaning/hygiene controls. This means organic producers from right across the Northern Rivers can purchase compost from us to utilise on their crops while maintaining their organic certification status. We initially achieved organic certification in 2012 for the green waste that people drop off at the Lismore Recycling & Recovery Centre, however achieving organic certification for kerbside food and garden waste was much more challenging. We now offer a full complement of composting products that are 100% organic certified. That’s excellent news for organic producers and excellent for us in a business sense. We have totally closed the loop on our green waste services and that’s something we can all be proud of. It means local organic producers can buy local and the money we generate can go into investigating and implementing further sustainability and recycling initiatives. Of course, you don’t have to be an organic farmer to buy our organic compost… it’s nutrient-rich and magic for any garden. The certified organic compost can be purchased from the weighbridge at the Lismore Recycling & Recovery Centre from $35 per cubic metre. 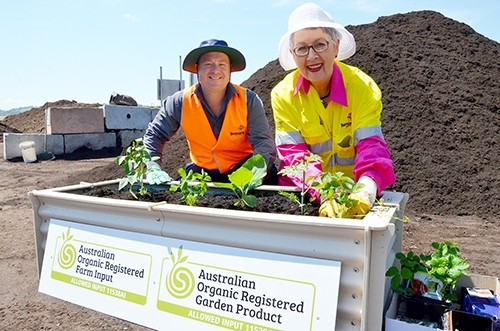 Image: Celebrating Lismore City Council's organic certification for compost made from food and garden waste are Waste Operations Coordinator Kevin Trustum and Lismore Mayor Jenny Dowell.